They say you should never really get to know your heroes because if you do you’ll just be disappointed. This may be true if your hero is Batman, but that’s because he’s just a moody dink. However, in the case of a super-powered bad @$$ like Captain Marvel knowing more about her background makes her more relatable and gives you a better reason to be invested in her plight. So grab a pen, a pad of paper, as well as your best Freudian suit, and get ready for Captain Marvel to spill her emotional guts. Captain Marvel is struggling with her anger and is finding herself caught up in events from her past. In order to confront these feelings and curb her anger, she decides to go home. What could possibly go wrong? Margaret Stohl isn’t pulling any punches, she is straight up grabbing the heartstrings and yanking them out. 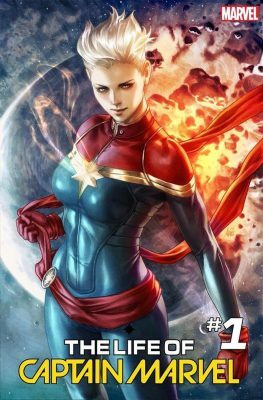 We are taken on a journey of exploration into the life of Captain Marvel and given a glimpse into her past traumas and family-related issues. Then if that isn’t enough, we are forced to see her deal with new dilemmas that can’t just be solved with a fist. Apparently, X-Men aren’t the only superheroes with an excessive amount of drama in their lives, and even though we may feel bad for our heroes as they face these obstacles… we can’t deny that it’s sure fun to watch. The story that Stohl is unfolding is an interesting and insightful tale that really makes you feel for Captain Marvel. Stohl also does well at pacing the story and keeping things moving in a manner that keeps you from losing interest. The direction the story is taking is intriguing and the ending leaves you with many questions. The art backing up this superhero bio is a great match for the serious tone of this book. It’s more realistic than the cartoon style seen in books like the current Avengers series. 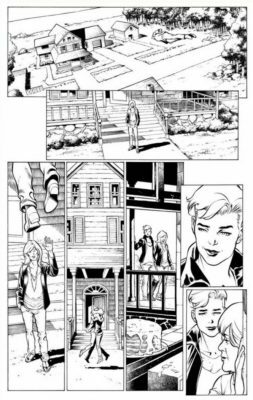 This style helps convey the emotion surrounding the events that take place in Captain Marvel’s eerily CW type life. There are many good visuals throughout the book that hit on the feelings Captain Marvel is experiencing. Including my favorite on page 21. 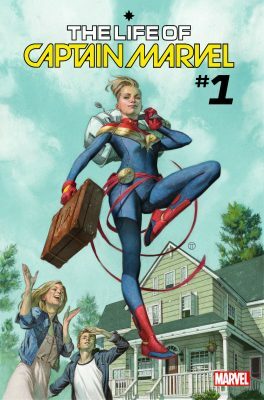 If you are a fan of Captain Marvel, it might be nice for you to learn a little more about the experiences that have shaped/drive her. Or if you’re not a fan or know nothing about the character this is a great place to start. It’s also not a bad idea to get this book in an effort to prepare yourself for the upcoming film. Just beware this book contains feelings. *P.S. Check out that wicked Art Germ cover!